Reliable Business Services at the Lowest Prices. Locally owned and operated, Tyler’s Sanitation supplies businesses in the city of Aiken and Aiken County with the most reliable services at the lowest prices. 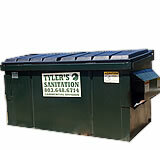 Having a variety of front loading containers ranging from 2 cubic cards to 8 cubic yards, Tyler’s Sanitation can customize a plan for all your waste and recycling needs. Call today for a free waste and recycling consultation. Contact Us About Your 2 yd Container! Contact Us About Your 4 yd Container! Contact Us About Your 6 yd Container! Ideal for larger businesses with higher volumes of waste. Contact Us About Your 8 yd Container! Any business that wants to recycle! Contact Us About Your Recycle Container!